TAIJI, Japan, December 20, 2011 (ENS) – Twenty officers of the Wakayama Prefecture Police Sunday raided the Charmant Hotel where Sea Shepherd’s Cove Guardians have been staying near Taiji. Armed with a warrant, which they claimed was for video taken by Cove Guardian Erwin Vermeulen, the police seized all of the Sea Shepherd volunteers’ computers, phones, hard drives, photos, cameras and other items that the police deemed “suspicious,” the nonprofit organization said in a statement. 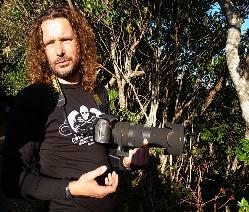 None of the three Sea Shepherd volunteers at the hotel were arrested during the raid. The cell phones and cameras, emptied of all SD memory cards, were later returned to them. No reasons have been given for this raid, said Sea Shepherd, a marine mammal defense and advocacy organization based on the U.S. island of Friday Harbor, Washington. Sea Shepherd’s Cove Guardians have been present to photo-document the traditional killings of dolphins and small whales in Taiji every September through March since 2008. Their mission is to promote public awareness and to pressure the government of Japan to stop supporting and permitting this practice, according to Sea Shepherd founder and president Capt. Paul Watson. The Cove Guardians follow strict guidelines from Sea Shepherd headquarters to respect all local laws, maintain a low profile, and to serve as journalists to witness and document events. This is the first time that Cove Guardians have been imprisoned, subject to search and seizure, or accused of violating any local laws. The town of Taiji on the Kii peninsula is now the only place in Japan where drive hunting of dolphins and pilot whales still takes place on a large scale. When a pod of dolphins is spotted, they are driven into a bay by fishermen banging on metal rods in the water to scare and confuse the animals. 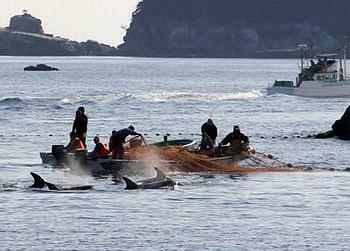 After the dolphins are in the bay, it is closed off with nets. The dolphins are caught one by one and killed or kept alive for sale to commercial establishments. In 2009, a documentary critical of the hunts in Taiji, entitled “The Cove” was shown at the Sundance Film Festival and then was named winner of the 2010 Academy Award for Best Documentary. The raid on the Sea Shepherd volunteers follows the arrest of Dutch citizen and Cove Guardian Vermeulen, who was charged with assault on an employee of the Dolphin Resort Hotel in Taiji. Vermeulen had been filming the transfer of dolphins from the sea to holding pens at the resort, when the employee called out to the police and claimed that Vermeulen had pushed him. No one witnessed this event. Vermeulen has been held in jail at Shingu since December 16 with no communication or visitation permitted from Sea Shepherd personnel or family members. This is the latest in a recent series of instances of harassment of Sea Shepherd volunteers in Japan. Two female Cove Guardians were assaulted by a fisherman on November 5. Despite video evidence of the unprovoked assault, the fisherman was just questioned briefly and then released. On arrival in Osaka airport Thursday, enroute to Taiji, a male Cove Guardian from the United States was stripped to his underwear, searched, and all of his computer equipment, camera, and Sea Shepherd clothing and paraphernalia were taken from him. No reason was given. 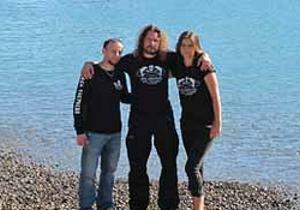 Detained and stripped of all electronics and communications equipment except their personal cell phones during the hotel raid were Sea Shepherd’s remaining three Cove Guardians – Scott West, Melissa Sehgal, and Ron Ball – and one volunteer from the nonprofit organization Save Japan Dolphins, Heather Hill, all U.S. citizens. They have since been released. 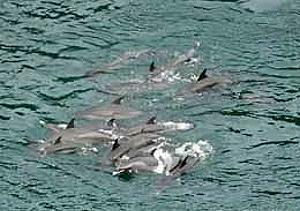 The marine mammal hunt in Taiji will continue through the end of March 2012. Sea Shepherd is asking members of the public to send emails, letters, phone calls, and other communications to local Taiji government offices, the Fishermen’s Union, Taiji Whale Museum, Dolphin Base, the Dolphin Resort hotel, and Japanese embassies and consulates around the world asking for a halt to the killing. The government of Japan has been taking multiple approaches to hobble Sea Shepherd’s protests of their dolphin and whale slaughters, through combinations of arrests, harassment, lawsuits, and imposition of financial and psychological hardship on the organization and its volunteers. The government has filed a lawsuit against Sea Shepherd in the United States, for allegedly interfering with their annual whale hunt. They claim to have spent the equivalent of US$30 million this year, over and above their usual subsidies, to equip their whaling fleet now headed for the Southern Ocean Whale Sanctuary with new tactics to oppose Sea Shepherd, which will have a whale defense fleet of three ships with 88 crewmembers there to prevent whale slaughter. This, despite the underfunded Tsunami Relief Fund and despite the International Maritime Organization’s new regulation banning the use of heavy fuel oil, the type used by the whalers’ factory ship, south of 60 degrees latitude.